Always Villa, recently entirely renovated, is decorated in appealing white to showcase its clean lines, as well as gleaming polished floors. It has plenty of space for large families or groups. The grand staircase is a definite draw, leading from the main level of the villa to the deck and pool below. It has six bedroom suites and six bathrooms so everyone will enjoy maximum privacy, and the bathrooms are designed in Victorian style. The living and dining areas are spacious, both inside and out, and the kitchen is fashioned after European design and provides Viking appliances to use. Always Villa is really close to the beautiful Terres Basses beaches. Take to the beach or sit on the balcony and admire the amazing views. Always Villa is built on two levels, offering 6 bedroom suites. It has a vast living/dining area and gourmet kitchen, a large pool and deck with poolside gazebo. 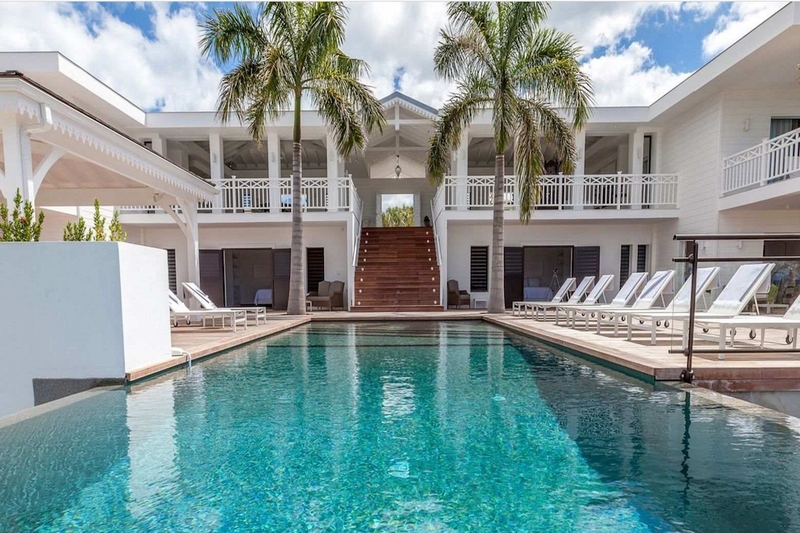 The main level is accessed via a small bridge and water feature; it houses the stunning white interior spaces of the living/dining area furnished with designs by Manutti, Blanc D’Ivoire, and Philippe Starck, and includes white oak flooring throughout. The European-designed Haker kitchen has Viking appliances, white quartzite work tops, and polished concrete flooring. The whole length of the living and dining area is completely open on one side to the ocean sunset view, as well as the view over the pool area. On either end of the living area are two huge bedroom suites, each with king–size custom-made beds and Blanc D’Ivoire furnishings. Both suites have private balconies overlooking the pool terrace and “Victoriana” style en-suite bathrooms with Devon & Devon fittings. A grand staircase descends from the main level to an extensive deck with a large infinity pool and shaded gazebo, with outside dining and lounge area furnishings by Paola Lenti and Tribu. Always Villa is a Caribbean retreat ideal for large families or groups. It is located within minutes of the beautiful Terres Basses beaches. Round trip airport transfer and basic provisions stocked in the villa prior to your arrival.